Deniz Gündüz received the B.S. degree in electrical and electronics engineering from METU, Ankara, Turkey, in 2002, and the M.S. and Ph.D. degrees in electrical engineering from NYU Polytechnic School of Engineering (formerly Polytechnic University), Brooklyn, NY, in 2004 and 2007, respectively. He is currently a Reader (Associate Professor) in the Electrical and Electronic Engineering Department of Imperial College London, and is leading the Information Processing and Communications Lab. Previously he was a Research Associate at CTTC, Barcelona, Spain, a Consulting Assistant Professor at the Department of Electrical Engineering, Stanford University, and a postdoctoral Research Associate at the Department of Electrical Engineering, Princeton University. He also held a visiting research collaborator position at Princeton University from October 2009 until November 2011. Dr. Gündüz is an editor of the IEEE Transactions on Communications, and the IEEE Transactions on Green Communications and Networking. Previously he served as an editor for the IEEE Journal on Selected Areas in Communications (JSAC), Series on Green Communications and Networking, and a guest editor of the EURASIP Journal on Wireless Communications and Networking, Special Issue on Recent Advances in Optimization Techniques in Wireless Communication Networks. From 2013 to 2016, he served as a co-chair of the IEEE Information Theory Society Student Committee. He is a General Co-chair of the 2018 Workshop on Promises and Challenges of Machine Learning in Communication Networks at the IEEE Int'l Conference on Communications (ICC), the 22nd International ITG Workshop on Smart Antennas, and a Technical Program Co-chair of the 2018 IEEE International Conference on Green Computing and Communications (GreenCom). He also served as a General Co-chair of the 2016 IEEE Information Theory Workshop. 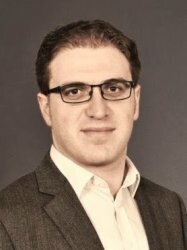 Dr. Gündüz is the recipient of the 2017 Early Achievement Award of the IEEE Communication Society - Communication Theory Technical Committee (CTTC), a Starting Grant of the European Research Council (ERC) in 2015, the 2014 IEEE Communication Society Best Young Researcher Award for the Europe, Middle East and Africa Region, and the 2008 Alexander Hessel Award awarded by the Electrical and Computer Engineering Department of New York University Polytechnic School of Engineering for the best Ph.D. dissertation. He is also a recipient of the Best Paper Award at the 2016 IEEE Wireless Communications and Networking Conference (WCNC), and the Best Student Paper Award at the 2007 International Symposium on Information Theory. His research interests lie in the areas of communication theory and information theory with special emphasis on energy efficiency, privacy/security, and joint source-channel coding. You can follow his publications and citations on the Google Scholar page. A more frequently updated website can be found here.